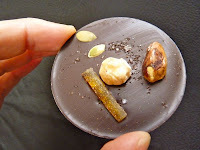 More European style chocolates with hazelnuts and almonds. Today's choice: a thin, round, mendiant-style chocolate topped with a thin strip of candied citrus peel; hazelnuts; almond and pecan pieces that might have been too small to see; pumpkin seeds; and a light sprinkle of sea salt -- with a fancy embossed wavy pattern on the backside. These mendiants would look at home anywhere on a dessert plate. 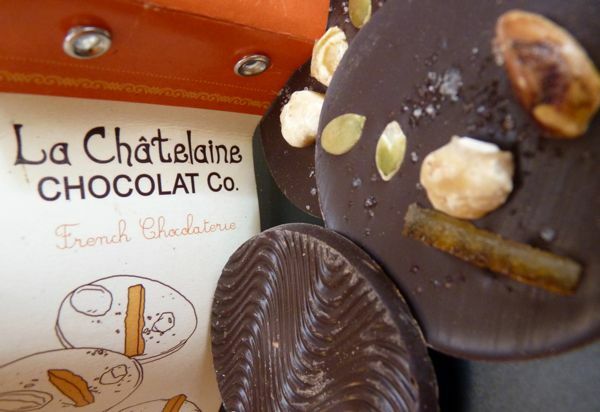 La Chatelaine Chocolat Co., a French Chocolaterie, is based in Bozeman, Montana. Today was Day #8 of Chocolate and Almonds Theme Week, and Day #4 of Chocolate and Hazelnut Theme Week. Labels: chocolate and hazelnuts, La Chatelaine Chocolate Co.